A chiweenie is a designer dog, first seen in the 1990s. They are a cross of the dachshund and a chihuahua. Created by accident, dachshund-chihuahua crosses have risen in popularity within the last 10 years due to their appearance, energy and loyalty. This increase in popularity is unsurprising as they make an ideal lapdog due to their small size, cuddly nature and never-ending energy. This dog is perfect for seniors or singles, being able to thrive in a bustling city and away from suburbia. Is the chiweenie the right choice for you? Read on to find out more about this adorable little pooch! Is A Chiweenie A Good Family Dog? How Much Do Chiweenies Cost? Affectionately nicknamed “the Mexican hotdog” or “the German Taco”, chiweenies are a small and loveable companion. They are a type of designer dog, a cross of a dachshund and chihuahua. It is a multi-purpose dog, thriving wonderfully as a lapdog and companion but they also make wonderful guard dogs due to their tenacity. Chiweenies usually have the build of a dachshund, with a longer body and tail and little paws. Their ears and face can vary between features from either the chihuahua or a dachshund. Eyes can either be black, brown or blue. Chihuahuas don’t usually weigh more than 6 pounds, and miniature dachshunds weigh about 12 pounds. As a result of this, the chiweenie, being even smaller in size, weighs between 8 and 10 pounds whilst standing between 8 and 12 inches. There does not tend to be a huge amount of difference between male and female dogs. They comes in a variety of colors; most commonly black, blonde, tan and white. Although, they can also be silver, fawn or blue. Due to the dachshund influence, these may be solid or bi-coloring. They usually have short, smooth and glossy coats, however this isn’t always the case. 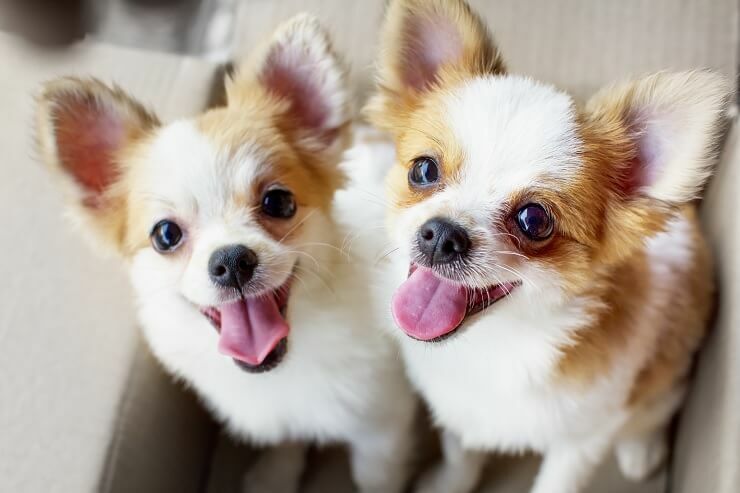 Chihuahuas are known for having much thicker (almost wirehaired) fur, so depending on its parents chiweenies coats vary in length and thickness. One thing you can almost guarantee though is that their coat should be smooth and soft to the touch. In order to understand the chiweenies’ personality, we must first look at the breeds it was crossed from. A chihuahua is a dog of Mexican descent and is also the smallest dog in the world. These small dogs have huge personalities, they are known to be stubborn, but when well socialized they can be loving and tenacious pets. Dachshunds come from Germany, with ‘dach’ meaning badger and ‘hund’ meaning dog. 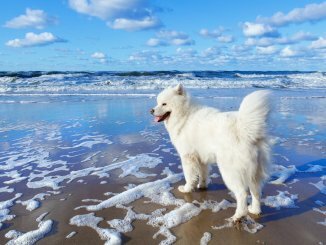 This small yet majestic dog comes in a variety of sizes, coats and colors. Bred to hunt badgers and wild boar when in groups, dachshunds are wonderful diggers. Clever and lively dogs, they are perfect for a family. Dachshund-chihuahua crosses have the perfect combination of personality from their parents. Small, cute and cuddly, they are highly sociable dogs and aren’t fussy about who they cuddle with. However, these loyal sweethearts usually tend to favor one person over everyone else. Due to this favoritism, they can suffer from separation anxiety. This may also result in aggression towards strangers. However, with effective training, positive reinforcement and good socialization these issues can be minimized. Alongside these personality traits, they tend to inherit the dachshund’s tendency to dig. They love to dig, both outside and inside, including their bed and house carpets. Chiweenies tend to be quite loud, yippy dogs, barking at anything and everything (from the postman to new people in the house). They are also known to be howlers. Again though with positive training this undesirable quality can be corrected. Being socialized from a young age will help calm their loud personality to that of a loving and social nature that mixes well with new people. They have very high energy levels, loving to run and play with their favorite companion(s), but they are also equally happy to curl up and nap on the couch with their human counterpart. It is important to remember that, like all mixed breed dogs, they may inherit more tendencies from one purebred parent than another, or may be a perfect hybrid. It is very difficult to tell what specific qualities your dog may have. After all, dogs often also take characteristics from their owners! Chiweenies can be suited to families, providing they are socialized from puppyhood. However, due to their tendency to favor one person over-all others, they are best suited to a smaller household (such as singles and seniors). This dog is also a good match for couples without kids. These dogs are very intelligent and love to learn. However, like their parents, they tend to be quite stubborn. This is not an issue as patience is the key to unlocking your chiweenies’ full potential. Short sessions with delicious and varied food rewards will really encourage them and increase her capacity to learn. They learn quicker when their body is well exercised. We recommend short daily walks to unlock your dog’s physical potential as well as their mental one. Remember there is no strict time limit on how quickly your dog should learn; once again patience is key. Keep your sessions short and if you find that you are getting frustrated come away and try again later. If problems persist, try looking at how quickly you are rewarding the behavior; they should also respond very well to clicker training. Like their parents, it is not unknown for chiweenies to develop little dog syndrome. Little dog syndrome is the name given to a series of bad behaviors seen in little dogs to overcome their small size. Good socialization while they are young will help them respond better to new people and dogs. They can be particularly sensitive to younger children; therefore good socialization with this age group is also essential. Being a toy dog, chiweenies have very low exercise needs. That is not to say that it doesn’t need exercise but a short walk and indoor play will make for a happy and healthy dog. They tend to be quite fast paced and headstrong, so if you let him off the leash make sure he’ll come back! Due to the potential for inherited back problems, play should be kept light with limited jumping. Because of their size, they don’t need a lot of room to move about. A moderately sized apartment or garden would be enough space for them to stretch their legs in. It is important to make sure this garden is fenced so they cannot dig their way out! Remember we mentioned above that their coat can vary depending on whether they mainly inherit a Chihuahua or Dachshund coat. Well their grooming routine will need to be tailored to the their specific coat. For example if your chiweenie has a longer coat, they will need grooming once a day; otherwise they will get matted hair, and potentially cover the whole house. They need bathing roughly once a month but feel free to increase the frequency depending on their activity level. They are seasonal shedders, so tend not to shed much beyond growing in a summer and winter coat. With regular brushing, their coat will be very manageable. They do very well on a dry diet such as dry kibble. This also has the added benefit of helping them avoid potential dental problems (more on this later). If you are going to feed your dog kibble, select a high quality, grain free version. You should feed your adult dachshund-chihuahua cross twice a day, half in the morning and half in the evening. However, if you are click-training with treats remember to factor this into their diet. They are known to be very healthy dogs. The combination of dachshund and chihuahua corrects a lot of breed specific health problems seen with the pure breeds. For example, dachshunds are known to have spine problems created by their long body, and dental problems created by their long noses. Due to them having a shorter back and snout, in most cases these health problems are removed. The same thing can be seen in chihuahuas, which have weak bones and fragile hearts, but this issue is significantly less likely to be seen in chiweenies due to the influence of the dachshund. However, a few typical canine health problems including hip dysplasia, eye problems, skin conditions and allergies are still there. However these aren’t too common and should not be a reason to not get one of these guys. Also due to their dachshund heritage, they may be prone to dental problems, so require regular tooth brushing. How Long Do Chiweenies Live? Chiweenies tend to have an average lifespan between 13 and 16 years. Although, the oldest recorded is currently 21 years old. 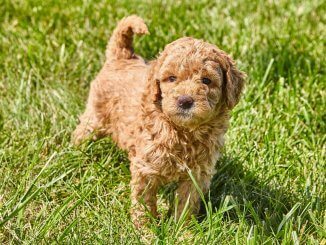 When purchasing a puppy, the most reliable designer breeders are those from reputable dealers. Unfortunately puppy farms are all too common and tend to operate through social media or Craigslist. Where possible your best bet is to get a referral. Do you know anyone that already has a Chiweenie and can put you in touch with their breeder? If not then you should thoroughly inspect the breeder before buying from them. When purchasing a puppy, ask to see the mother with the pups and take a close look at the housing conditions. With the puppy itself the most important thing to look at is temperament. You want a puppy that is not too shy, but not too bold. If the puppy appears to be aggressive, look at another breeder. 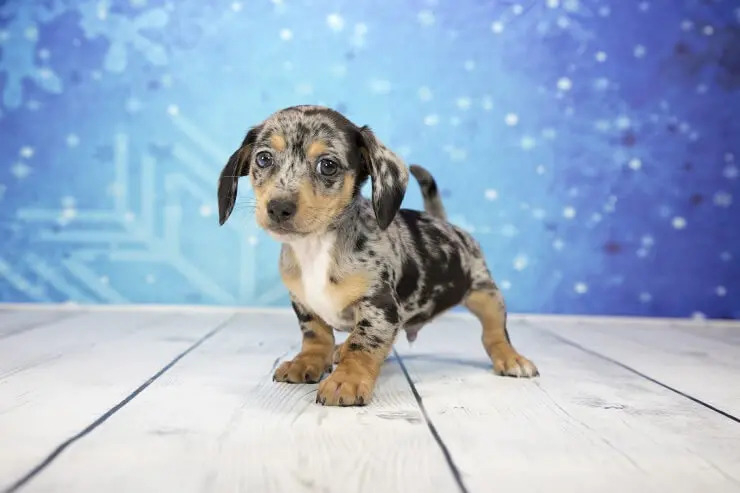 If you would prefer to adopt rather than purchase a puppy, charities like the Dachshund Rescue of North America (DMA) do re-home these dachshund mixes. Due to their increasing popularity, Chiweenie puppies sell for anywhere between $200 and $500. On top of this, average yearly “maintenance” can be anywhere up to $800. Color: Most common colors are black, brown, tan and white, either solid or bi-color. 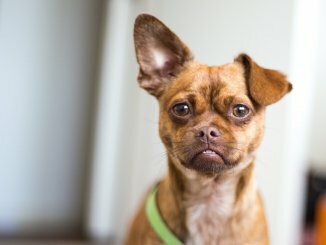 Is the Chiweenie the right dog for you? Loving and loyal, they are the perfect dog for anyone who is looking for a side kick. 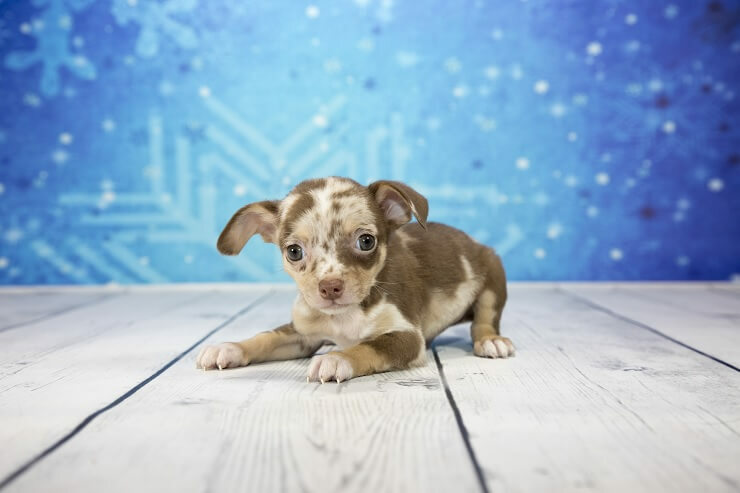 Happy to go out and play or curl up on the couch at home, the dachshund-chihuahua cross is perfect for someone looking for a little extra love in their life. Who wouldn’t want something this cute looking up at them when they come in through the door?